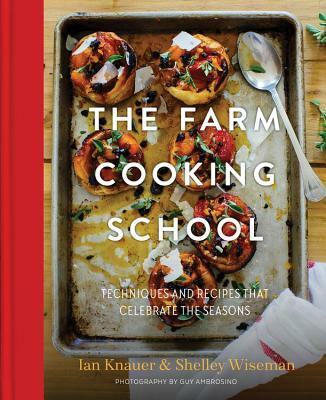 Join us at the Doylestown Bookshop for a talk and food demonstration with The Farm Cooking School's Ian Knauer & Shelley Wiseman on Tuesday, April 24th at 6:30 pm. In their “A Case for Seasonal Eating” they discuss the health and environmental benefits and impact of eating locally and in season - giving guests approachable and realistic methods to incorporating these practices into their own lives. In addition to this very informative talk, they will demo several recipes utilizing locally sourced ingredients which guests will be invited to taste. When you visit The Farm Cooking School you'll not only leave with a full stomach, but having learned something new. The Farm Cooking School is packed with many of the same lessons you'd learn in person at the school, taught through more than 100 delicious recipes. You'll learn how to make the flakiest pie crust for peerless summer pies, use fresh farm eggs for sweet, airy pavlova, and highlight what's growing now with scratch-made pizzas and pastas. Smoking, salt-roasting, pickling, and preserving are all part of the fun. Yet it's the way Ian and Shelley employ these techniques that make their classes, and this book, so much fun. Brine nasturtium buds for creative "capers," or try the hot-smoked oysters with a dollop of harissa butter and you'll agree. Ian honed his cooking skills in the world-renowned test kitchens of Gourmet Magazine for almost a decade before returning to his family's farm in Pennsylvania where he wrote a cookbook (The Farm: Rustic Recipes for a Year of Incredible Food) and made a television show, also called The Farm, which airs on PBS and Amazon Prime. Ian founded The Farm Cooking School in 2014. Shelley Wiseman met Ian at Gourmet Magazine, where she was the magazine's Travel Food Editor and a recipe developer for 12 years. Shelley is the author of two cookbooks and has cooked and taught cooking all over the world, including at her own cooking school in Mexico City where she taught French Cuisine for 6-years. After a stint running the kitchens at Fine Cooking Magazine, Shelley is back doing what she truly loves- teaching and collaborating with others about great food. The Farm Cooking School is located at 67 Pleasant Valley Road in Titusville, NJ and offers hands-on cooking classes, culinary vacations, and camps for both adults and children year round. Our facility is located on a beautiful property in the heart of the Delaware River Valley, which is also home to Roots to River organic farm and the Barn at Gravity Hill. We believe there is more to cooking than just knife skills and following recipes. Our philosophy is that cooking starts with two “c’s”: confidence and community. Confidence begins to build as we learn the basics of techniques and flavor, and grows as we explore new ingredients and cuisines. And something really amazing happens when you gather around the stove and table with others: community. New friendships form, conversations flourish, and a greater understanding for the importance of cooking deepens. Roots to River's main fields are located on a 60-acre farm in the heart of Solebury Township Pennsylvania. In both Titusville and Solebury, they grow high quality produce, specializing in heirloom varieties and year-round production for farmer's markets, restaurants and a community supported agriculture program. Roots to River supplies the school with a majority of its fresh produce, flowers, and herbs, some of which are picked by students right before classes! The partnership between the farm and the school provides a model for what truly local and seasonal eating looks like where the farmer is deeply connected to the people they are feeding.